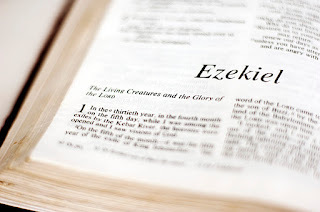 Ezekiel's vision of the Valley of Dry Bones is very familiar to us (Ezekiel 37). But what struck me recently about this text is the connection between prophecy and hope. “Prophesy over these bones, and say to them, O dry bones, hear the word of the Lord. Thus says the Lord God to these bones: Behold, I will cause breath to enter you, and you shall live." Prophesy over these bones. Say to them, "You shall live." The point that struck me is how we tend to think of prophets as bringing words of judgment and doom. And to be sure, the prophet does bring those words. But the prophet also brings a word of hope. In Ezekiel 37, the prophet speaks words of life. Prophesy over these bones. Say to them, "You shall live." The prophet speaks life back into the dead. Our world needs these prophets. People are lost, despairing, and hopeless. You and I, we have a job to do. Let us speak life back into the dead. Prophesy, the Lord commands, over the bones.